For Honor Nobushi Guide, a list of all available Move-sets and Button Combos. Learn about the Special capabilities, as well as the different tiers of feats unique to this character. Fast Revive | Huge variety of Support Feats. Your Renown is evenly balanced across all activities. Boosts Damage and Health. All Attacks are Uninterruptible. Parry and Throws knock enemies down. Attacks are Auto-Parried on activation. Does extra Damage when hitting someone already affected by your Bleed. The Startup has a Dodge property. Basic Attacks Startup can be canceled into Hidden Stance. Hidden Stance can be followed up by Attacks, Kick or Dodges. Attacks can be followed up by the Hidden Stance, Viper’s Retreat or Kick. Kick can be followed up by Hidden Stance or Cobra Strike. Third chained Light Attack is guaranteed if the second one hits the targets. Hit at the opposite of the direction of the Dodge. Side Slashes can be followed up by a Hidden Stance, Viper’s Retreat, Kick or Dodge. Cancel Zone Attack after the first Attack. 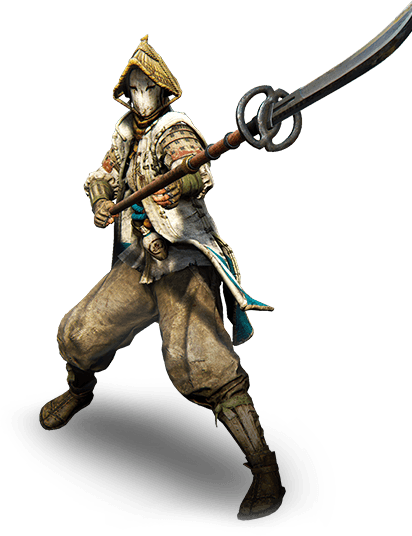 This section of the For Honor Nobushi Guide is focused on Gear Building, below we list the best stats to build on Nobushi’s Gear. This Character has Very strong bleed damage, combined with the longest attack range in the game. Extended fights with a Nobushi can be suicide if you can’t handle her, and she is also a great harasser. This section of the For Honor Nobushi Guide will explain a little more about this heroes strengths and weaknesses. Examining the play style and the type of characters that counter this hero. This polearm users weapon of choice is a Naginata and it has a long range to its attacks, This character makes for a great 1v1 counter versus any short range heroes. Especially those who lack good gap closer abilities. Strong Bleed Damage Attacks Due To Way of the Shark Passive. This character has few counters, her weaknesses, however, though involve her stamina management.